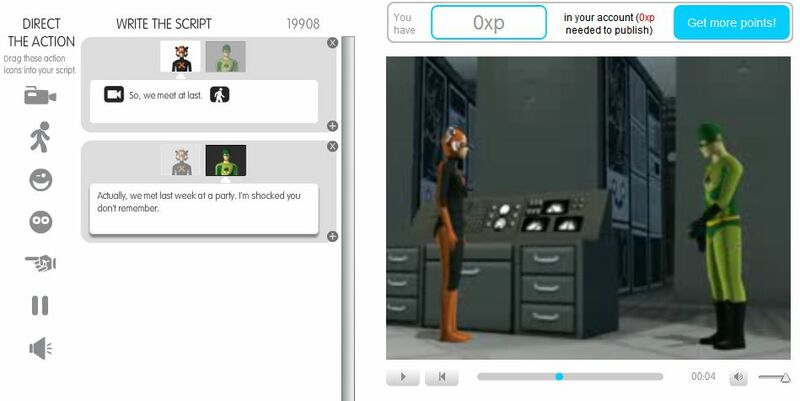 Text-to-Movie gives you the tools to create your own rudimentary (but cool) animated flicks. As always when I watch something clever and creative like that, I found myself wishing for the tools to produce my own little movie (and the hours of necessary free time--but that's another matter). Turns out the tools are available (and free!) in the form of Xtranormal Text-to-Movie, a simplistic but versatile moviemaking system that runs entirely in your browser. Text-to-Movie (TTM) gives you a choice of a dozen "showpaks," which consist of a setting and your choice of one or two "actors" (in this case animated avatars). All you do is write a script, then drag various "action icons" into the script for things like camera angles, facial expressions, gestures, and animations. There's definitely a bit of a learning curve, but I found that after fiddling for 10-15 minutes, I had learned the entire toolset. TTM is really, really fun, and the results can be pretty spectacular (as long as you don't mind monotone, computerized voices reading your dialogue). Definitely worth a look.